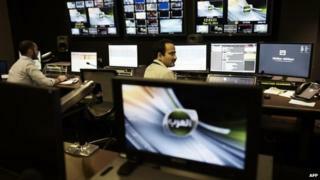 Bahrain's government has announced the suspension of a new Saudi pan-Arab news channel just days after its launch. The Information Affairs Authority said it was "decided to halt the activities of Alarab" because the channel had not "received the necessary permits". Al-Arab was on air for only a few hours on 1 February before it stopped scheduled broadcasting for "technical and administrative reasons". One of its first guests was a prominent Bahraini opposition figure. The decision to interview Khalil Marzook, deputy leader of the Shia political society al-Wefaq and critic of the Gulf island kingdom's Sunni ruling family, was criticised by pro-government media. Alarab TV, owned by billionaire Saudi businessman Prince Alwaleed bin Talal, launched with the promise of politically independent news. But shortly after the interview with Mr Marzook was aired, the channel reverted to showing promotional video and promising it would be "back soon". The Information Affairs Authority said at the time that programming would resume once officials had worked alongside Alarab's management to resolve the "technical and administrative" issues. The suspension of Alarab TV so soon after its launch must have been embarrassing both for the channel's owner and for its Bahraini hosts. Despite the administrative reasons for the stoppage cited by both sides, it has been widely assumed that the real issue was the channel's decision to give airtime to a Bahraini opposition figure, who would never have appeared on domestic Bahraini channels. In so doing, Alarab was in effect breaking the unwritten rule in Gulf states that broadcasters do not probe the internal affairs of their host countries. By choosing to start its broadcasts in such a controversial way, the channel may have been aiming to make a splash and to live up to its pledges of being politically and editorially independent. The reaction demonstrates the host government's extreme sensitivity and indicates that Alarab underestimated the uncompromising attitude of the Bahraini authorities. But on Monday, an IAA statement announced the channel's suspension "following its failure to obtain the required licensing approval to commence broadcasting in Bahrain". "The IAA emphasises that the channel had also failed to match the standards of regional and international practice agreements, to take account of efforts aimed at stemming the tide of extremism and terrorism throughout the region and the wider world." It added: "The IAA stresses that the decision has no impact upon principles of media freedom and is strictly based on the government's commitment to ensuring the diversity and impartiality of media outlets in the Kingdom." Bahrain has seen years of unrest since the government's suppression of Shia-led pro-democracy demonstrations in 2011. A national dialogue process is currently at an impasse, with the opposition accusing the ruling Al Khalifa family of wanting to retain all powers, and angry Shia youth are increasingly turning to violence.